These are fundamentally the same design. 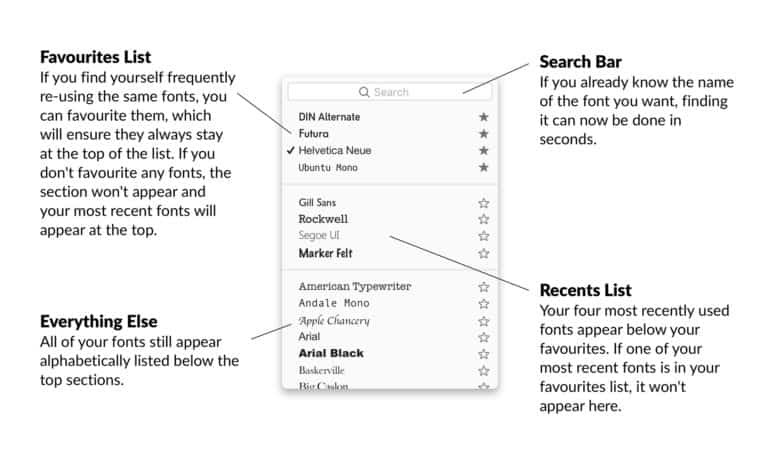 Sam lists three main problems with the existent macOS font menu. It’s too long, and there’s no way to shorten it. The “Recents” section at the top isn’t that useful. “Even fonts you only use once get prime spot at the top of the list for a period of time,” writes Sam. It lacks good keyboard navigation. A favorites list, where you can keep your most-needed fonts. A search bar, so you can quickly narrow the selection using the keyboard. A recents list. This is just like the existing recents list, only it’s given a less-prominent position. Favorite fonts are excluded from this list. A regular alphabetical list of all the fonts, just like today’s design, for folks who like to use it. There is another neat addition to Smith’s redesigned Mac font picker: Every entry in the menu has an empty star icon next to it so you can quickly add a font to your favorites. I like this design, and I think it would be equally at home on iOS. For more of Smith’s work, follow him on Twitter or check out his website.